Personalised Boozy - GIN, PROSECCO, CHAMPAGNE (or other fun text) Socks for your Mum, Best Friend, Bridesmaids or Hens! Currently available colours: light blue, mauve, light pink, light peach. See additional sock pictures (no text on them) for guidance on colour. Other colours (charcoal and light grey) due back in stock shortly - convo us for more details. Please note: the cream socks shown here with text on are examples only - sock colour options as listed above only. Choose text in gold glitter, silver glitter, charcoal rainbow glitter, bright pink glitter and bright pink flock text. 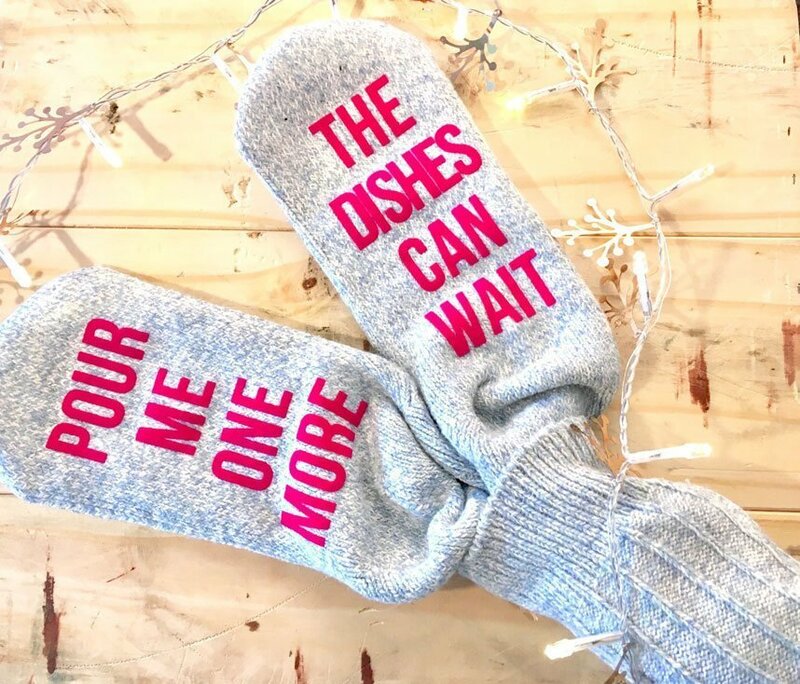 SEND A GIFT OF SOCKS GIFT DIRECT! We will wrap and send direct to them on your behalf with your chosen message (on the socks and on a gift tag). Lovely soft warm thermal ladies boots socks with your choice of message on both feet. Wear them tucked into your boots or snuggle up in them in front of the tv. We recommend 4 lines of text per sock and NO MORE than 6 letters per line of text. Just select your sock colour (from the new colour selection) and your text colour (tip: the silver text doesn't show up as well as the pink or the gold on the blue socks), and message us your chosen words - whether from our suggested ones or your own. IMPORTANT: WHEN YOU CHOOSE YOUR OWN WORDS, WE WILL SEND YOU A PROOF (by Etsy convo). WE WILL FULFILL YOUR ORDER AS SOON AS YOU CONFIRM YOUR APPROVAL OF THE PROOF. Socks are a wool blend, machine washable and come wrapped in tissue with a care tag attached.